A different version of chicken wings. Less messy and makes a nice addition to game day or party appetizer trays. It's very versatile, using different chips and salsa, as well as any chicken pieces you want...wing sections, drummies, or even boneless tenderloin or breasts cut into large bite size pieces. Rinse and slightly pat chicken pieces to leave them just damp. Beat eggs and drop into large zipper bag. Combine tortilla chips, taco seasoning, and pepper in large zipper bag. Add a few chicken pieces at a time first to the egg bag, then the seasoning bag and shake until thoroughly coated. Repeat with remaining chicken. Arrange in 9X13 baking dish sprayed with non stick spray. Bake at 350 for about 30 minutes or until chicken is done and coating is crispy. Meanwhile, combine salsa, sour cream and dressing mix and refrigerate until serving. Add cilantro to dip at serving. Made this last night and it was a hit. I cut up some boneless chicken breasts, used lime tortilla chips, and only used about half of the salsa. We will be having this again soon-I will be trying it with about half a packet of taco seasoning nest time as it was kind of overpowering. Otherwise perfect recipe! Another great post - 5 forks again! I love the sound of this! 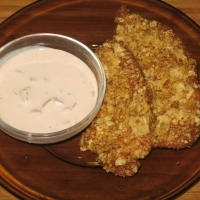 I might make these using chicken tenders. Good stuff! !